Rhonda Fotiades, left, Senior Public Affairs Specialist for Pioneer Natural Resources and Joey Hall, right, Vice President of the South Texas Asset Team for Pioneer Natural Resources present Coastal Bend College President Dr. Beatriz T. Espinoza, center, a $25,000 donation to help support workforce programs. 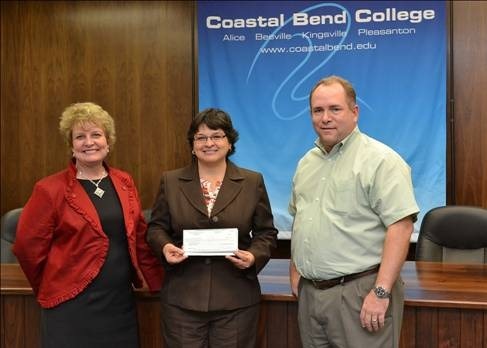 BEEVILLE, TX—Pioneer Natural Resources, Inc. presented a $25,000 donation to Coastal Bend College on October 18, 2012. The donation will be utilized to help improve and expand workforce programs the college offers that lead to employment in Eagle Ford Shale related industries such as welding, oil and gas technology, and drafting and design. “The Coastal Bend College Foundation is sincerely grateful for the recent donation put forward by Pioneer Natural Resources. Our college, our students and our faculty all benefit from, and rely on, the generous community support of our successful industry partners,” said Christy Lansford, the CBC Foundation Executive Director. CBC prides itself on offering quality workforce programs and customized and continuing education courses that help people in the communities we serve find employment in the Eagle Ford Shale industry. For more information about how you or your company can help support CBC workforce programs, please contact Christy Lansford at (361) 354-2447 or via email at foundation@coastalbend.edu. For information about workforce programs and courses, please contact an advisor at (361) 354-2266 or visit your local CBC campus.